The UNESCO World Heritage site, the Honghe Hani Rice Terraces, in Yunnan province is known for being aesthetically amazing. And the autonomous prefecture that hosts the attraction is just one part of the province's tourism upgrade. 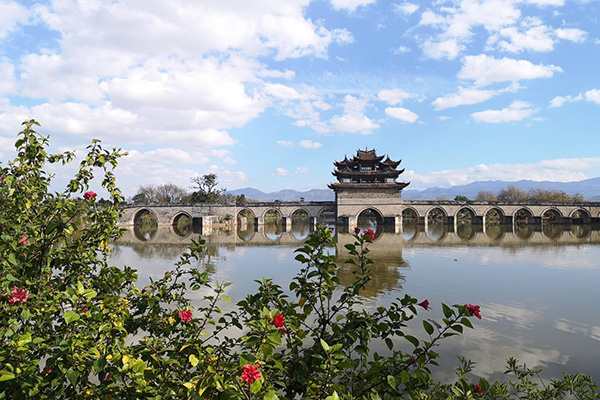 Its Mi'le city has invested over 3.1 billion yuan ($457 million) on four towns, to improve such aspects as infrastructure and livelihoods. More funds are slated. Redbrick castles in Dongfengyun town host galleries and boutique hotels. The Dongfengyun project's marketing manager, Yu Wenjie, says the destination has offered studios to several veteran artists. It has also worked with art schools on programs. And the town has provided preferential policies to attract young artists. Local craftspeople will showcase traditional kite-making and calabash-carving events in February. Nearly 740 Axi people, a branch of Yi ethnic group, inhabit Keyi town. Modern wall paintings adorn the 370-year-old settlement. Visitors also enjoy Axi dances, folk arts and produce. Locals treat guests with songs and toasts. Tourism and e-commerce have lifted them out of poverty. "Many villagers like me came back to work in tourism," says local tour guide Zhao Jianmei, 35.